New Mexico’s literary legacy includes a long tradition of memoirs by ordinary people whose circumstances put them in extraordinary moments of history. That so many individuals chose to chronicle their adventures as they journeyed from points east into the wild and mysterious territories of the western half of the continent has meant a bounty of historically accurate details about daily life that most of us could only guess at otherwise. History buffs are well acquainted with books by Marian Russell, Susan Shelby Magoffin, and Agnes Morley Cleaveland, who all traveled through or settled in the state in the mid-19th century. Their faithful recordings of daily hardships—whether of attacks while navigating the Santa Fe Trail, or the trials of keeping an adobe house and mud floor clean of the day’s dust—bring to life our collective history through the eyes of the women who soldiered through it. Fast forward 100 years, and Isabel Ziegler’s memoir of settling in the Española Valley in the 1940s achieves a similar effect. Like those before her, Ziegler’s achievement lies less in wordsmithing than in chronicling daily life in a time and a place that differ greatly from the familiar present. “I know that I was raised in sheltered and protected surroundings. If I had visited New Mexico or been schooled about its cultures and languages, I would have been better prepared. As it was, having to adjust my whole outlook about my life and hopes in such a short time proved difficult for me,” Ziegler writes, remembering her first impressions as a young doctor’s wife when they came to el norte from Dayton, Ohio, to help start the area’s first hospital. 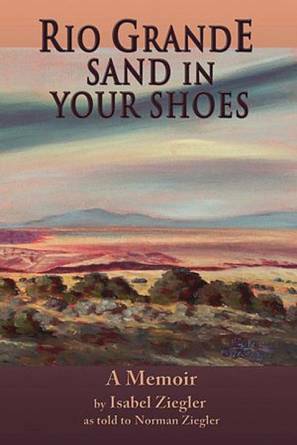 Ziegler dictated the memoir to her son Norman in the later years of her life, and makes it clear from the outset that Rio Grande Sand in Your Shoes is her tribute to her husband, Sam’s, invaluable contributions to rural Río Arriba County in the middle of the 20th century. It was a time of open spaces and isolated villages, when el doctor was nervously summoned by a knock on the door at midnight, and pregnant women took their chances on delivery at home or struggled to make the long drive to Santa Fe. In keeping with the times, Ziegler promotes her role as supportive wife and busy mother, but she also notes many telling details about her full-time duties in designing and managing their fledgling clinic, as well as integrating her family into the fabric of the slowly developing community. In a straightforward style, she recalls visits with Georgia O’Keeffe, the long drive from Abiquiú to La Fonda Hotel for dinner, and the drama of local politics. While the narrative is sometimes uneven and could have benefited from editorial oversight, from a historical point of view, Ziegler’s personal recollections offer an invaluable look at daily life in a rural but rapidly changing pocket of New Mexico. Candelora Versace is an award-winning writer who has been freelancing in Santa Fe since 1991.